When attacking a Lawman, Roy "Lawless" Mcready always adds 1 automatic skull to whatever is rolled. After attacking with Roy "Lawless" Mcready, roll the 20-sided die. If you roll a 15 or higher, you may attack again with Roy "Lawless" Mcready. When rolling defense dice against a normal attack from an non-adjacent figure, if Roy "Lawless" Mcready receives no wounds from the attack, the attacking figure receives one wound. How does Roy "Lawless" Mcready' Bullet Haze work? Does he have to attack the same opponent? No, once Roy "Lawless" Mcready attacks one opponent, you can choose any figure within range and attack again. The second figure can be the same figure you attacked the first time, or a different one. As a Unique Hero who follows Utgar, Roy "Lawless" Mcready may take an extra turn using Ornak's RED FLAG OF FURY AURA. As a medium figure who follows Utgar, Roy "Lawless" Mcready benefits from Torin's EVIL EYE PROTECTION special power when he rolls defense dice against a normal ranged attack while he is adjacent to Torin (Roy "Lawless" Mcready's excess shields count as unblockable hits inflicted by Torin on the attacking figure). As a figure who follows Utgar, Roy "Lawless" Mcready causes small and medium figures that are friendly to Ana Karithon and within 3 clear sight spaces of her to roll an extra defense die when Roy Mcready attacks them, due to Ana's PROTECTION FROM EVIL AURA. As a figure who follows Utgar, Roy "Lawless" Mcready causes opposing Templar Cavalry figures to roll an extra attack die against him with their RIGHTEOUS SMITE special power. As a Unique Human, a destroyed Ebon Armor you control may be placed on Roy "Lawless" Mcready's Army Card to replace Roy "Lawless" Mcready upon his own destruction. The figure used for this unit is Foolkiller from Marvel Heroclix Set. 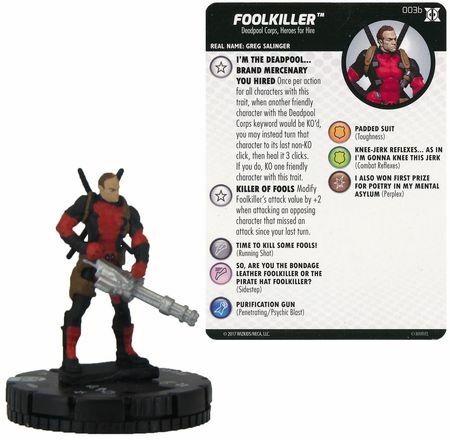 The name and model number is Foolkiller Deadpool and X-Force #003b. I like the flavor going on with this guy. The only thing I can see that needs changed is the Bulletproof vest ability. Its that a Bulletproof vest doesn't ricochet back to the attacker. Also, when the wearer is shot, it still hurts pretty bad, just doesn't kill them as easily when getting hit by smaller caliber rounds. He no longer has the Bulletproof Vest power anymore. 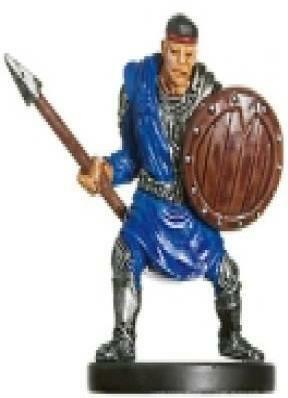 The figure used for this unit is Caravan Guard Angelfire #001 Wizards of the Coast set. P.S. I changed the powers on Emperor Anguilla. Any Soulborg figures within 2 spaces of Omegacron*, they roll 1 fewer attack die. All small or medium opponent's figures that enter or occupy a space adjacent to Omegacron* may not move. Figures affected by EMP Cyberclaw can roll 1 fewer defense die. Omegacron* use this special attack 4 times in the same turn. Omegacron* may target the same figure or a different figure with each attack. When Omegacron* rolls defense dice against an attacking figure who is not adjacent, Omegacron* adds 4 dice. * Being a Soulborg that follows Vydar, Omegacron* may aid Blastatrons with their HOMING DEVICE attack bonus. As a Unique Soulborg Hero, Omegacron* can benefit from Beorn's UPGRADE ability. As a Soulborg, Omegacron* can be exploded by Executioner 616's REMOTE DETONATION. As a Soulborg Hero with a Range of 1, Omegacron* may benefit from Hoplitron's MELEE SOULBORG BONDING. Last edited by Heroscaper 101; Today at 09:46 PM.